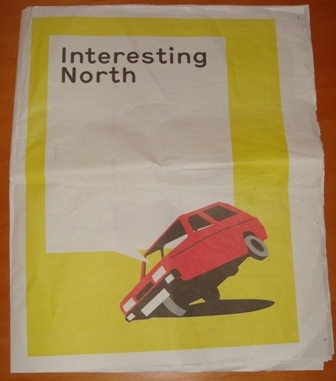 So I was at un-conference Interesting North in Sheffield yesterday. It was fab. The premise of the Interesting conferences (normally held in London and organised by Russell Davies, but transplanted to the North by Tim Duckett) is about ‘a day of brilliant people talking about their secret obsessions’. Basically, it’s about Brain Food that you might not find totally useful right now, but feel much better off for having been introduced to. All the elements of the previous Interestings were there – bunting, fun badges, a stage, some speakers and an audience armed with cameras and notebooks instead of the usual laptops that normal conference attendees pull out. I also suspect that most normal conferences don’t involve enough denim to start a rodeo and a lot of people wearing DMs or trainers. Which was what made the venue of Cutlers Hall such a contrast. Posh is an understatement, it’s a grade two listed, bling-tastic tardis of a place. 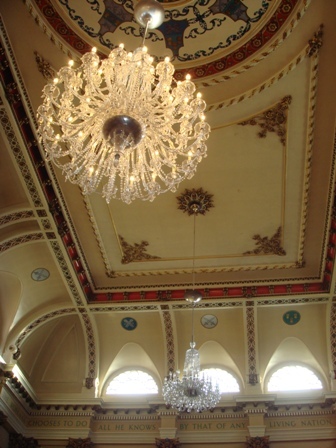 The Main Hall we were in had chandeliers and maple panelling salvaged from the White Star liner Olympic – sister ship of the Titanic. Even the bloke taking coats was wearing black tie. Oh, yeah. I spoke too, about How Ladies Stay On Sideways (27/01/11 video has just gone up!) . Seemed to go OK and even though we were running an hour late by then, 95% of the audience were hell-bent on staying until the bitter end. For all the people who asked me afterwards about where their horsey sister/wife/friend could have side saddle lessons, get in touch with The Side Saddle Association and they’ll send you a list of local instructors. Or drop me an email (addresses on the right) and I’ll check my members handbook to see who’s near you. There was also a really good goody bag for everyone. It must have been good because everyone took theirs with them – I only had to follow the train of people carrying brown bags up the hill to find the post-IntNorth pub. It even included branded merchandise – Umbro had very kindly donated several hundred t-shirts that should have said ‘we won the world cup’, but for obvious reasons were surplus to requirements and printed with the Interesting North logo instead. My T-shirt is a unisex large, far too big for me. If you’d like it, leave a comment below explaining why and I’ll pick the best one. The other genius thing the organisers did was print the un-conference program in the form of a newspaper (via newspaperclub). My newspaper looks a bit battered as I was referring to it on and off all day long. Not only did anyone like me who arrived a bit early have something to read, I really felt I got more out of the talks by understanding a bit more about the speakers. It’s also easy to find people on t’interweb after an event when someone has handily printed their twitter and url next to a photo of them. Thanks to Howies and their Dohboy for sponsoring lunch (meaning all the fivers went to the local Archer Project homeless day centre), Technophobia for funding the AV costs, Rattle for paying for the newspaper and Kiosk for the rather marvelous Interesting North identity. And of course, thanks to Tim, Greg, David, Saul, Aden, Jag, Ian, Erica and Dan who made it all happen. See you all next year? Or how about a geographic compromise and we try Interesting Midlands? Next Post John Lewis Christmas ad – have I found another version or perhaps a work in progress? Thanks for the write-up Gemma, and for your kind words about my talk. Yours was great, and so true to the spirit of Interesting. What a brilliant day! What Matt said, and ditto on enjoyiing your talk too. My wife informs me that she’s tried riding sidesaddle and fell off. So are there sidesaddles for men? If not, why not? 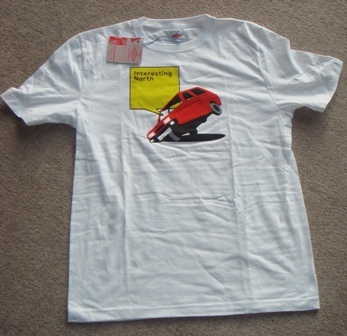 I’ve got some medium tshirts left over, which are a little less tent-like – would you like one? Re “James – no side saddles for men as the whole point of them was that it was a ‘next best’ solution to the female-specific ‘can’t have legs on show when riding’ problem :-)” What rubbish! Of course men can ride side saddle. In the 1920s my mother knew a man who hunted SS as he had lost part of his leg in the trenches diring WWI and couldn’t ride astride. It was not uncommon then. There was also a male riding member of the Northern Side Saddle Group when I was a member some years ago. Riding for the Disabled groups often use side saddles for riders of both sexes. As for not showing the legs, the earliest form of pommel on the modern side saddle was introduced because the then Queen of France, Catherine de Medici, actually wanted to show off her legs. Don’t run away with the idea that side saddle is only for fainting violets. Side saddles give a very secure seat and a slightly built woman riding side saddle has a better chance of controlling a difficult horse than a large strong man, so much so that the old grooms, such as my grandfather, used to school badly behaved horses in side saddle. Re: “My wife informs me that she’s tried riding sidesaddle and fell off.” She must have tried very hard then. It’s not very easy to fall off a side saddle. One look at the saddle will show you why. Henrietta – I stand corrected on your ‘legs on show’ point, but really meant that side saddles weren’t designed with men *in mind* – although a few men undoubtedly get/got on very well with them. And James – she’s right about the hard-to-fall off point, thanks to my horse’s over-enthusiastic response to cantering (i.e. bucking) I’ve tested it!